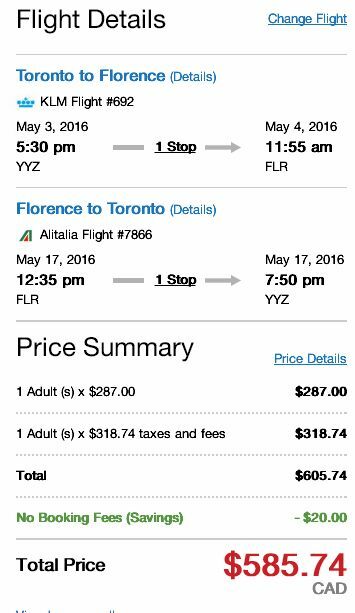 KLM and Alitalia are showing flights from Toronto to Florence, Italy (FLR) in April and May 2016 for just $585 CAD roundtrip including taxes. Previously available for off-season months of November through March, there now seems to be dates becoming available for warmer months. The average high in Florence in April/May is an ideal 20-23C. UPDATE 1 - Oct 2 @ 8:23 AM EST: These are back today, only slightly cheaper. You can find them on RedTag for $545 CAD roundtrip including taxes. Follow the steps below. 1. They are bookable through RedTag.ca and FareDepot.com at the moment. RedTag and FareDepot are ranked #11 and #17 respectively in the Third Party Booking Site Power Rankings. FareDepot is showing them for slightly less, at $569 CAD roundtrip including taxes, but it's probably worth the extra $16 to book with RedTag. 2. When you get to either RedTag or FareDepot, try searching for a flight from Toronto (YYZ) to Florence, Italy (FLR). Try dates in April or May 2016. Note that RedTag does not always show the fastest flights at the top of their results. The fastest flights are the ones that have between 11h and 13h of total travel time in each direction. 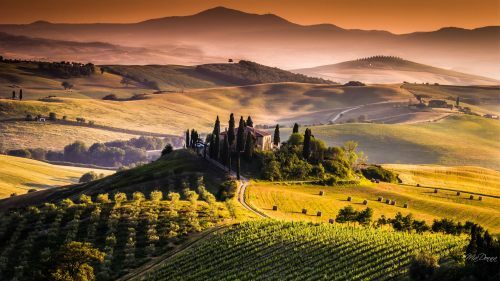 toronto, yyz, flight deals, europe, western europe, southern europe, italy, klm, alitalia, florence, flr and tuscany.